See All of The Mall! 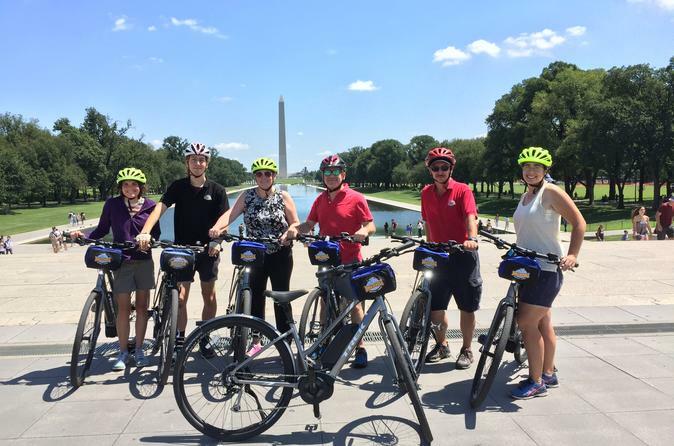 Our Monumental Electric Bike Tour route covers the whole National Mall from The Capitol Building to the Lincoln Memorial and all the way around the Tidal Basin. E-bikes are the hot new trend in cycling. Come on tour to see what the hype is all about while learning about the monuments and memorials in "America's Front Yard". Visit all the iconic monuments and memorials while pedaling less on our sleek Trek Verve+ e-bikes. As you pass by various Smithsonian museums along the National Mall our knowledgeable guides will inform you on the latest happenings at the museums. If you are looking for the best selfie spot in the city, we’ll give it to you behind our Nation’s Capitol Building. Then, ride right up the middle of Pennsylvania Ave to the White House in the bike lanes – right along the route that all the newly inaugurated presidents have taken! Next, we’ll visit the west side of the Mall where we’ll explore and learn about the WWII Memorial, Lincoln Memorial, Vietnam Veterans Memorial, and Korean War Veterans Memorial before circling the Tidal Basin to the Jefferson Memorial. Your guide will also stop and share some hidden gems along the way; we show you all the major monuments and memorials as well as treasures you won’t find if you explore on your own. See more, pedal less. It’s Electric!